Oil prices have surged to record levels after traders bet that the Opec oil producing nations will reduce output. In New York, the main contract for light sweet crude oil hit a record high of $100.10 a barrel before closing at $100.01, up $4.51. 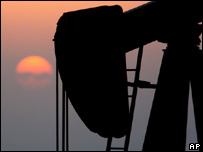 Market analysts say Opec producers might cut production in response to the slowdown of the US economy. There was also concern over supplies from Nigeria and the ongoing row between Exxon Mobil and Venezuela. Opec oil producers meet on 5 March. "Production is not going to increase. It will either decrease or be stable," Opec President Chakib Khelil said on Monday. Analysts think a cut in production is increasingly likely. "Opec is showing every sign that it will move to cut production at it March meeting," said Phil Flynn, an analyst at Alaron Trading. "It seems that Opec is only focused on price and the economy be dammed."